But let’s take a moment to seriously consider how accurate that statement is. “All Christians are hypocrites,” some people say. Should we be so quick to concede the point? Or should we reject that premise outright? First of all, what is a hypocrite? The Merriam-Webster dictionary defines a hypocrite as “a person who puts on a false appearance of virtue or religion,” or “a person who acts in contradiction to his or her stated beliefs or feelings.” The word “hypocrite” comes from the Greek word for an actor. All Greek actors wore masks to hide their true identity and take on the role they were playing. So when you think about the original meaning of the word, think about someone who wears a mask – someone who hides his or her true appearance by putting on a false front. The Lord Jesus had a lot to say about hypocrisy. He attacked it head-on, and He reserved His most vehement condemnation for the hypocritical scribes and Pharisees of His day, men who were “like whitewashed tombs, which outwardly appear beautiful, but within are full of dead people’s bones and all uncleanness” (Matthew 23:27). The hypocrites of Jesus’ day proudly displayed their piety in public, but inwardly they were far from God. The same is true today. Because yes, there are hypocrites in the Church. It’s sad, but it’s true, and until the Lord Jesus returns, this sad state of affairs will continue. There are those who profess faith, but whose profession is false. There are those who say one thing, and do just the opposite, and they may even be among those who speak out in the most vehement way against the shortcomings they find in others. But… are all Chrstians hypocrites? The simple, two-letter answer is this: “No.” Not all Christians are hypocrites. Far from it, in fact. Think back to some of the most outstanding figures from Church history, the heroes of the faith – people like Polycarp, and John Hus, William Tyndale, and Dietrich Bonhoeffer, men who gave their lives for the sake of the faith that they professed. They weren’t hypocrites – not even close. But it’s not that we can just dig out a few exceptions from the long, sordid history of the Church to find a few assorted souls who didn’t fall prey to the spiritual disease of hypocrisy. The church throughout the ages has been filled with men and women, boys and girls, who were about as far removed from the role of “hypocrite” as you can imagine. Not all Christians are hypocrites. Not even the majority of Christians are hypocrites. By and large, despite their weaknesses, failures, and shortcomings, the Christian Church is full of faithful, sincere believers, by God’s grace. But you might respond this way: “Just look at the second part of the definition you gave. Don’t we all sometimes act in contradiction to our stated beliefs or feelings?” And the fact is that yes, we don’t always practice what we preach. But that doesn’t mean that we’re hypocrites – it means that we are people who have been justified, while remaining sinners. The Christian life is a battle; we have to fight every day against our old sinful nature. We stumble and fall, all too often, and with often terrible, damaging results. A faithful Christian recognizes his or her weakness; he or she may not always succeed in the struggle against sin, but the central element of the Christian life is turning from sin, and turning to Jesus. It is recognizing our inability to succeed in the struggle against sin on our own; it is recognizing our failures, acknowledging them, and seeking salvation in Christ. Anyone who does that, and there are, thankfully, vast numbers of people who do, can never be considered a hypocrite. Such a person is a faithful follower of Christ Jesus, and to call him or her a hypocrite is to cast aspersions on someone who is being renewed by God in His image (Colossians 3:10), and thereby to cast aspersions, however unwittingly, on God Himself. So when someone tries to tell you that all Christians are hypocrites, there’s no need to imagine that we must give in to that assertion. Because it’s simply not an accurate characterization. 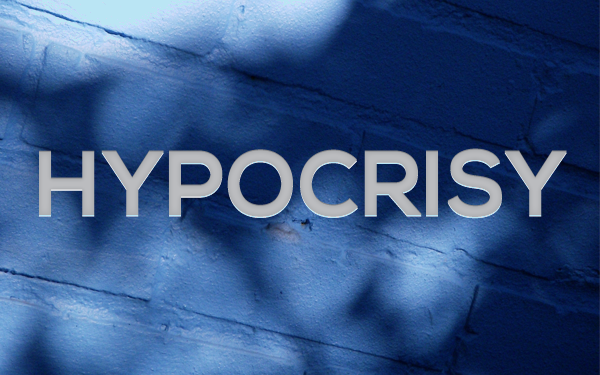 Some who call themselves Christians are hypocrites – that much is true. But they are the exception, not the rule. And in reality, the fact that hypocrites exist only serves to prove the truth of the gospel message. All people are sinners. All people need a Saviour. A true Christian is someone who has had his or her eyes opened to that fact, and who seeks salvation in Jesus Christ alone. That person is not a hypocrite; that person can joyfully declare, in the words of Answer 59 of the Heidelberg Catechism, “In Christ I am righteous before God, and heir to life everlasting.” Thankfully, hypocrisy is not a universal affliction in the Church of Christ, thanks be to God. We must fight against that accusation, and most importantly, show by our own lives that we aren’t hypocrites, so that accusation can never be legitimately levelled at us.